Paulus Berensohn has made a lasting impression on me. A few posts ago, I posted the lovely video “Soul’s Kitchen” about his journal work. And I’m going to do something I never did before. I’m going to post the video once more. Already. I watched it over and over again. And I thought you might want to see it again too. Paulus Berensohn has been making journals for a whopping 60 years or so. the relationship I feel with my journals, with my self. What a beautiful thought, to see your journals as your companions in life. is my ever growing collection of diaries and journals. I sometimes pity those who find them after I’m gone. Such a legacy I’m leaving behind! So true. I think I used and filled two purchased journals cover to cover. In the very beginning. But I bought far more than two. I just never filled them completely or at all. My heart will always go out to the intimacy of my handbound journals. Of the journals I had painted the covers of myself. making your very own journal is like making a nest to lay down your self. than purchased books. No matter how pretty they are. Sometimes when we get stuck, our journal can help us see the path we’re walking and the direction it’s heading. Just by being alert. Just by giving your path acknowlegdment in the form of a journal entry. To people who don’t journal, it may seem awkward and queer. of your brain, of your heart, of your consciousness. If I can journal regularly, I’m happy. 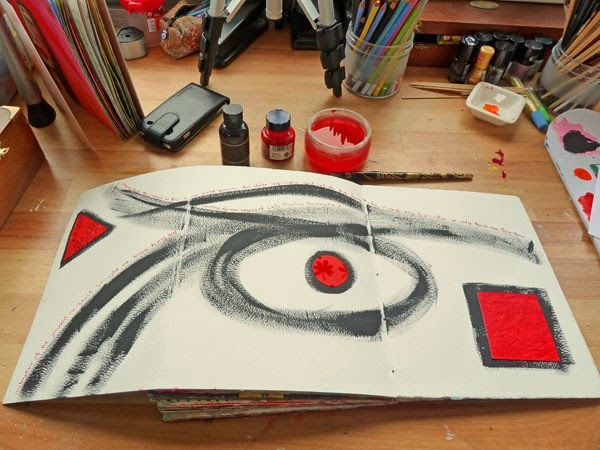 If I can’t, the kids will soon coax me to sit down in my studio and work in my journal a bit. This morning I leafed through some of my journals. And I realised that after I became a professional, my journals changed. They because lab experiments, technique experiments only. I had lost the life companion in them…quite a bit. So this morning I sat down and decided to make a page on intuition. Outcome unimportant. Only what I wanted to say. “Nest” – journal page. Acrylics and collage. “Looking back, my journal so far is one great search for styles, inspiration and artistic fire. Ironically, or probably logically, it only took me further away from my self. It was a liberating experience and I love the page very much. and noticed rudimentary figures in the lines that weren’t supposed to mean anything. Paulus Berensohn seems to have no website. But another, bigger film is being made of him.